Media processing in software enables consumer terminals to become open and flexible. Because consumer products are heavily resource constrained, this processing is required to be cost-effective. Our QoS approach aims at costeffective media processing in software. QoS resource management is based on multilevel control, corresponding to different time-horizons, and resource allocation below worst-case using periodic budgets provided by a budget scheduler. Multilevel control combined with budgets below worst-case gives rise to a problem related to user focus. Upon a sudden increase in load of an application with user focus, its output will have a quality dip. To resolve this user focus problem, we present the novel concept of a conditionally guaranteed budget (CGB). A feasible extension of our budget scheduler with CGBs is briefly described. 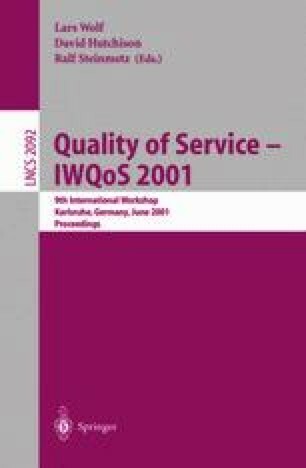 van Loo, S., Steffens, L., Derwig, R.: Quality of Service Resource Management in consumer Terminals, Philips Research Laboratories Eindhoven (PRLE), Doc. id. NL-MS21166, available from http://www.research.philips.com/manuscript/index.html, May 2001.